We are currently looking to add a Structural Engineering Technician of Technologist to our team. For more information please visit our Career Opportunities page. We look forward to hearing from you! Employees of G. Douglas Vallee Limited enjoyed their 11th annual golf tournament and for the first time the company's founder, Doug Vallee, was a member of the winning team! A good time was had by all at this much anticipated, fun filled event. Many thanks to the company executives for their generosity. The team at G. Douglas Vallee Limited is proud to have been awarded the role of Architect, Structural Engineer, Civil Engineer and Prime Consultant for the new Beachville Fire Station located in the Township of South-West Oxford. 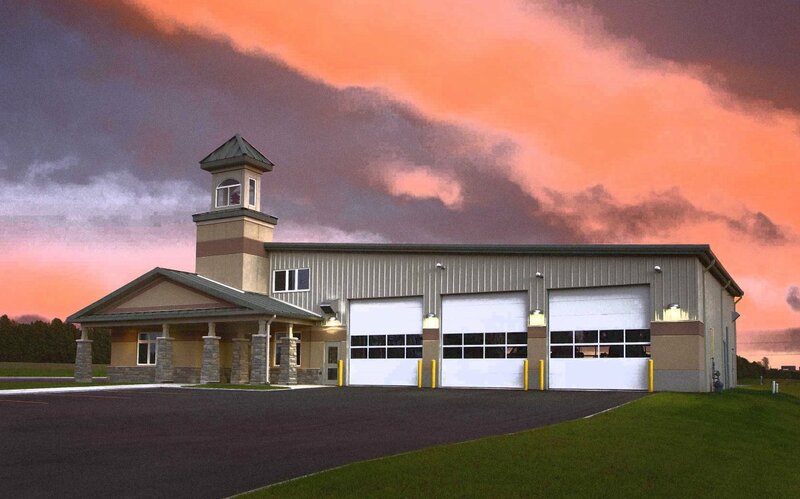 This project is a fantastic application of Vallee's extensive fire hall design experience. It is anticipated that this will be another sustainable building by Vallee with energy efficiency design and the goal of a Net Zero Energy being implemented. The opening of Lago Trattoria in Port Dover, Ontario marks the second collaboration of G. Douglas Vallee Limited with restaurateurs Ryan Rivard and Jennifer von Schleinitz. This new 40 seat restaurant serves up genuine Italian cuisine. The team at Vallee extend congratulations to Ryan and Jennifer in their latest venture. John Vallee and Michael Higgins of G. Douglas Vallee Limited recently attended a public open house for the proposed Port Dover Health Centre. Also present were board members for the Centre and Norfolk County officials. Architectural and Engineering drawings of the 17,000 square foot structure were on display giving citizens the opportunity to see the proposed building plan. Sunday June 26, 2016 marked the much anticipated ribbon cutting event for the new addition to Saint John the Divine Church in Cayuga. After a short dedication ceremony the building was open to the public. The new two level addition includes an elevator, an office and handicap washrooms on each floor. As the primary architectural and engineering consultant G. Douglas Vallee Limited incorporated modern amenities into the building while keeping the exterior design complementary to the original style of the 1896 stone church. Congratulations to Tony Yin and the team at the new Hoy's Restaurant. The Vallee team recently attended the opening of the newly renovated Hoy's Restaurant in Simcoe, Ontario. Also in attendance at the ribbon cutting were Tony Yin (co-owner), representatives from Prominent Homes (contractor) and Mayor Charlie Luke. Our Architectural team at G. Douglas Vallee Limited enjoyed being a part of this project. G. Douglas Vallee Limited is very pleased to announce that we have been awarded the 5 year contract with Norfolk County for bridge engineering. We are excited to provide the highest quality engineering services to the Municipality for another term. G.D. Vallee Limited recently matched employee donations to the Red Cross in the wake of the Fort McMurray, Alberta fires for a total of $440. This amount will be matched by the Federal Government. The recent fires are a national tragedy and we are pleased to contribute to the Fort McMurray community. G. Douglas Vallee Limited is pleased to announce that we have accepted the position as Engineer-of-Record to Haldimand County for their bridges for an unprecedented consecutive second term! We have had a great working experience with Haldimand staff and residents and look forward to serving through 2020.